I fondly recall summer evenings at my Grandparents’ house in Malesus, Tennessee. Granny and Granddaddy would sit on a swing bench on their front porch shelling butter beans. They would often be joined by my Aunt Effie and Aunt Mattie for the shelling and conversation. As they talked and shelled, I would run through the front yard chasing literally hundreds of lightning bugs. They were like little tiny helicopters buzzing around with their tails flashing. It was a nightly fireworks display. I was often joined by my cousins on these summer nights, and we would engage in a competition to see who could catch the most lightning bugs. The rules of “lightning bug catch” were simple. My cousins and I would simply run around the yard and reach out for lightning bugs that we would then cup in our hands. Each time we caught one, we would put them in one of my Grandmother’s Mason jars that later in the summer she would fill with preserves. We would punch holes in the lids of the Mason jars so our lightning bug captives could breathe. By the end of the evening, my cousins and I would each have in effect very small lanterns that glowed by the light of the fireflies’ tails. I confess that there were a few nights when I carried the lightning bug lantern back into my Grandparents’ house and put it on the bedside of the guest room where I was sleeping. During the night I would wake up from time to time to see my little lantern continuing to glow. Unfortunately, I soon discovered that when I did this, by the morning the Lord had called most of the lightning bugs home to that sweet by and by where they would glow on that beautiful shore. 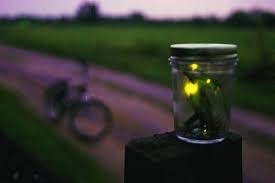 I felt bad about this, so I soon decided that at the end of each lightning bug competition on summer nights, I would open my Mason jar and free the neat little bugs to sore back into the sky. But sadly, as I grew up, I spent fewer summer nights outdoors chasing lightning bugs. Worse yet, on those rare occasions that I did take walks on summer evenings, I saw fewer and fewer lightning bugs. Alas, lightning bugs appear to be going the way of the dinosaur or perhaps more accurately, the Dodo Bird. Lightning bugs began to disappear for the simple reason that we humans kept invading their habitats, interrupting forests with houses and turning meadows into retail centers. We’ve paved paradise and replaced lightning bugs with parking lots. But a few weeks ago, after sundown, my wife and I decided to take a walk through our neighborhood. And when we did I suddenly saw a lightning bug. Not just one, but several of them in fact. Not hundreds like I would see on summer nights in the front yard of my Grandparents’ house but a few, and more than I had seen in years. I was thrilled to be reunited with my old firefly friends. I didn’t run in the house and grab an empty jar. I had no intention of catching any of these beautiful creatures and holding them captive, even for just a few minutes. I watched them dart around the yards in our neighborhood, and it brought back such great memories. Sarah Lewis is now reporting that firefly populations appear to be booming this summer. Lewis says that these reports are just anecdotal, but there does appear to be an uptake in lightning bug populations these days. Lewis attributes this to the fact that all across America, people are more intent in creating more green space, and thereby preserving and promoting the natural habitat for lightning bugs. I hope she’s right, and for the remainder of this summer and for many summers to come, more lightning bugs will illuminate the summer evening skies. It would be like having a 4th of July fireworks display in our front yards each night without the noise! Buck Wellford: I have the same memories from our deeply wooded back yard, which then joined our cousin's back yard. We would do the same thing with those lightning bugs. I tell my kids about that all the time. Good news on the lightning bug front!